HTC Smart Tools latest version is available to download. HTC Smart Tools is simple CMD application tool allows you to perform verious jobs on any HTC device. HTC Smart Tools is available to free download and easy to use. If you were already looking to download HTC Smart Tools then you are at right place. On this page you will find official link to download HTC Smart Tools. Before proceeding to download HTC Smart Tools here, on this page I am going to talk bit about its features and functions. 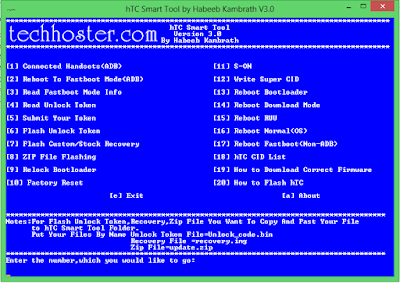 HTC Smart Tools is a simple tool developed and distributed by Habeeb Kambrat. It allows you to do verious task on HTC Smartphones. Below is the functions and features list of HTC Smart Tools. Flash Recovery feature allows you to flash custom and stock recovery on any HTC Device. using this feature you can boot or reboot into fastboot mode directly from computer. HTC Smart Tools works best with all versions of windows including windows XP, windows 7, windows 8, 8.1 and Windows 10.